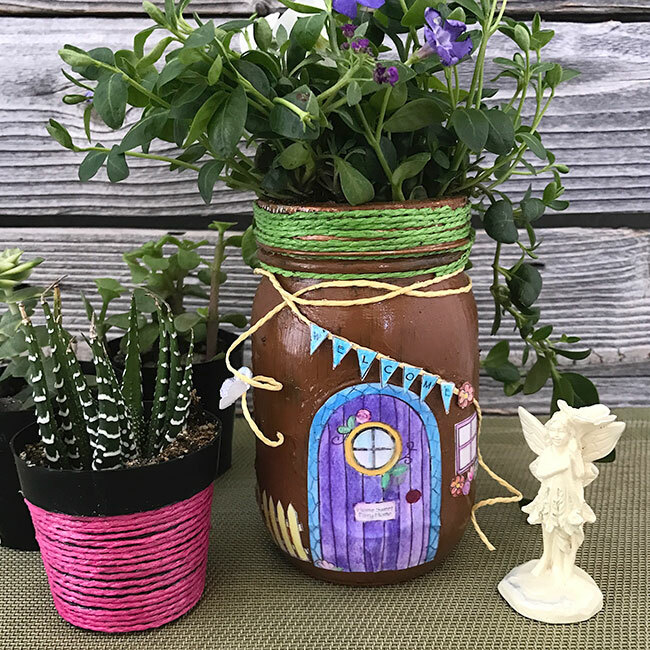 Jen Goode is back this month with an adorable DIY mason jar fairy house! This includes a free printable fairy garden coloring page that you can use for a variety of projects! 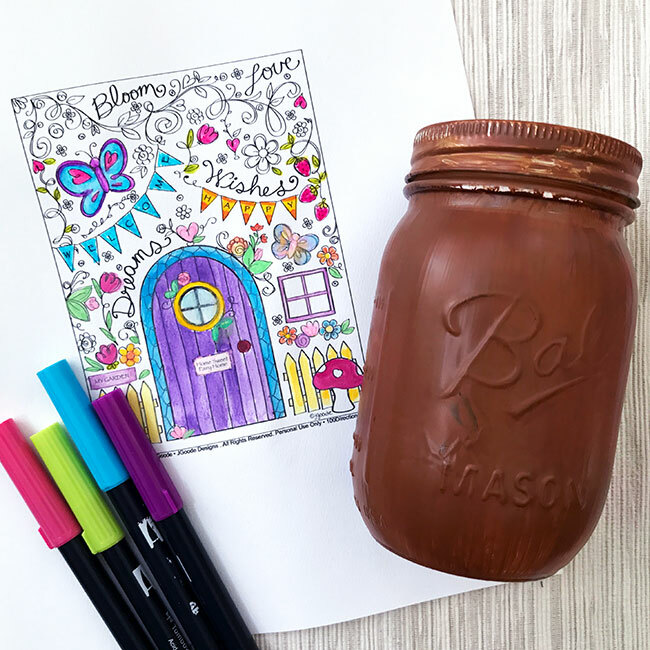 Make your own adorable mason jar fairy house using free printables and coloring pages. 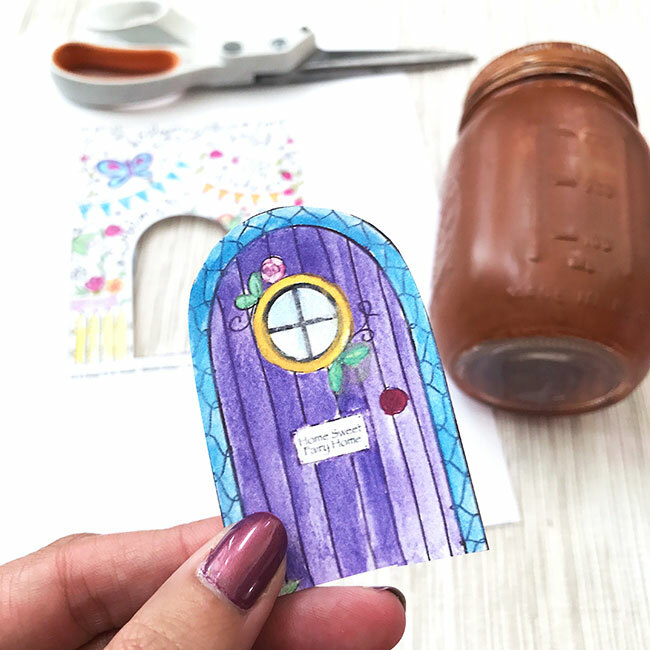 You can customize your fairy house with your own favorite colors and design ideas just by using printable art. Color it however you’d like and add your own personal touch! 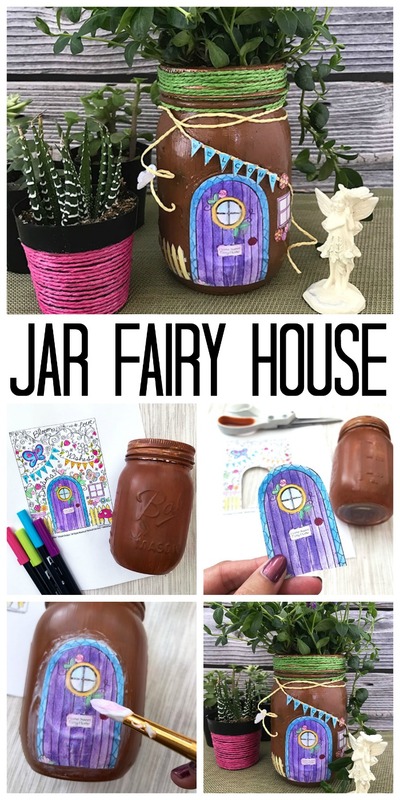 I’ve created a free coloring page you can use and today I’m showing you how to make your own fairy house using a standard mason jar. Let’s get crafty! You can paint your jar or leave it clear and add something inside. For my own fairy house, I wanted to grow a plant in the jar, so I painted the jar a light coat of brown. Multi-purpose paints seem to work best, especially if you plan to put your fairy house outside. Paint the mason jar and allow to dry. I covered my jar with just a single coat of paint because I knew I would be filling the jar with planting soil. You can apply as many coats and colors of paint as you’d like. Print and color the coloring page however you’d like. Cut out the pieces you’d like to use for you fairy house. I printed the art at 50% to shrink it to fit this specific jar project. You can resize the page to fit whatever size project you are working on. Decoupage the coloring page art to the jar. Using a paint brush, apply Mod Podge to the jar where you’d like to place your colored cut outs. The Mod Podge dries pretty quickly, so only apply in the area you are working for each individual piece. Place the paper on the wet Mod Podge, press into place and then cover with additional Mod Podge. Repeat for each piece you’d like to add to your jar. 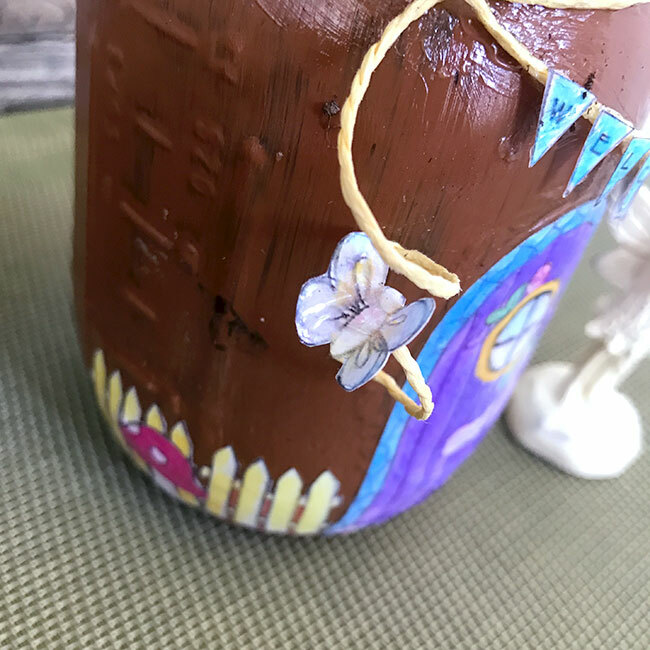 If you have additional accessories you’d like to include on your fairy house, the Mod Podge should adhere them. 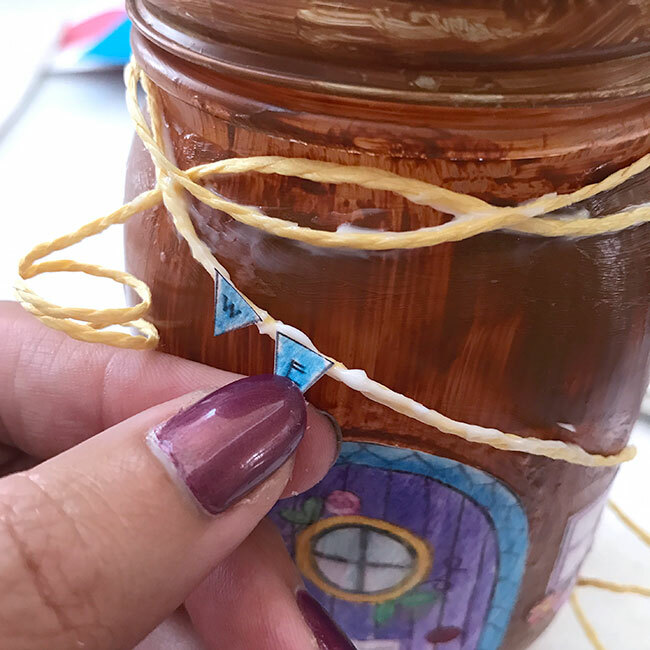 I wrapped twine around the top of my jar and added some fun little curling pieces that hang down the jar. I used Mod Podge to adhere the twine both at the top and to keep the little curls in place. 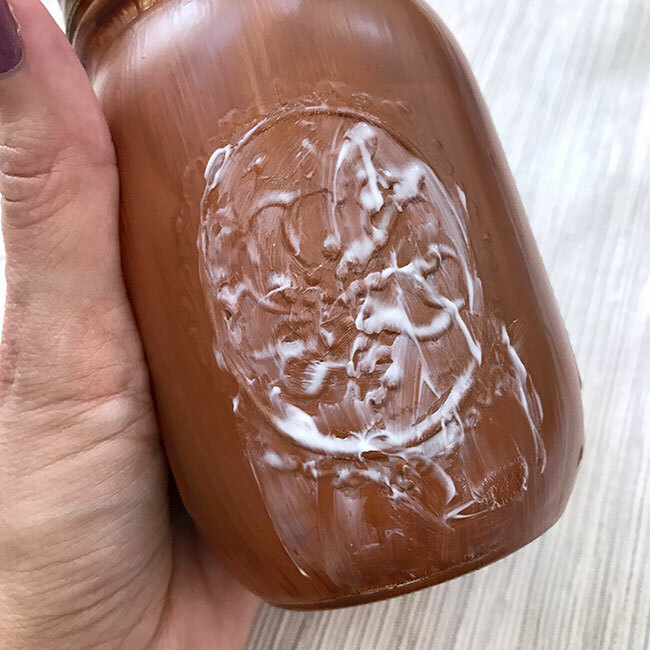 If you’d like, apply additional Mod Podge to the jar to even the shine around the jar. 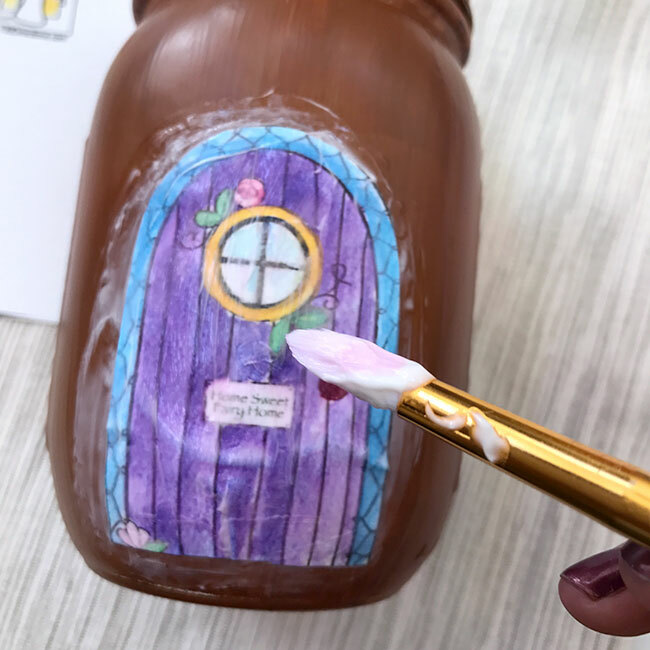 The Mod Podge can be a bit shinier than the paint, so you can use the Mod Podge as a sealer to add that extra finished look. This will also help weather proof the art a bit for outside use. 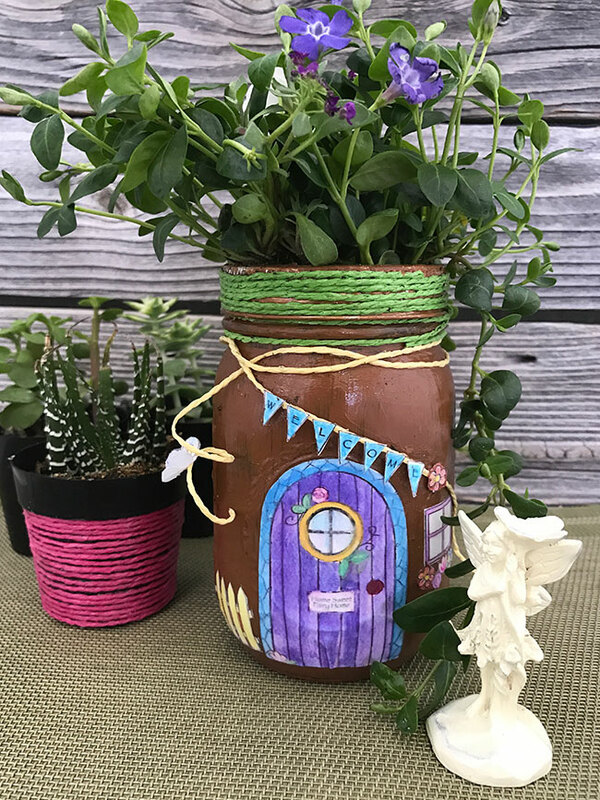 Add soil and the small plants to your jar to finish the look of your fairy house. 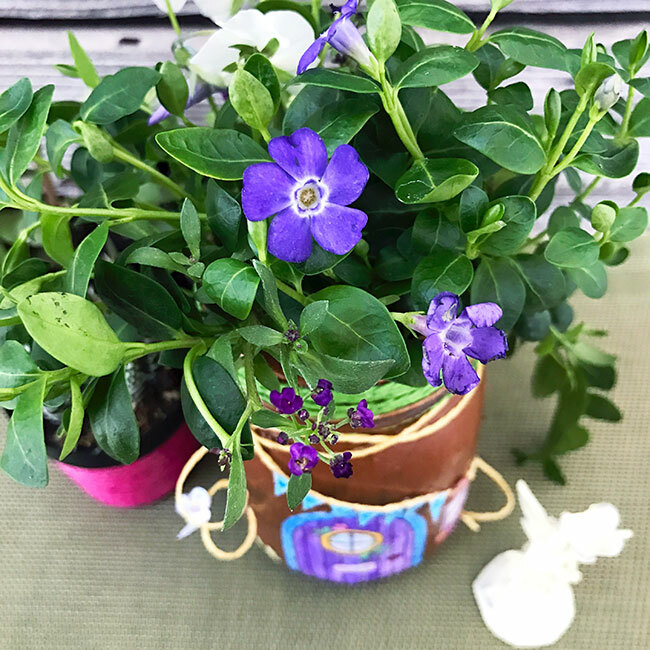 You can also use this little jar fairy house as a vase for flowers that you can change as the seasons change. Visit my blog to download the free fairy garden coloring page. Have fun with your fairy house making! You can create a whole village of cute fairy houses. Just color the designs differently and add different accessories to make each house unique. I cant wait to see how yours turn out! Make your own DIY mason jar fairy house today! Love this and want more? Try the links below! next post: Best Deviled Egg Recipe: A Family Favorite! I love Fairy Gardens and I am a fan of Jen Goode’s work. To have them both together is awesome, amazing and soooo cute. I am in love with this idea and I am going to get busy and make mine ASAP! Thank you for this cute project. I love this project! So cute. Pinning. Oh my god Angie this is so cute!! There’s a LOT of ways to use mason jars, but making a fairy house was not on my radar yet 🙂 Thank you for sharing at the Friday Favorites linky party! Did you get my imagination instead of me? This fairy house/planter is absolutely phenomenal, love, love, it. Have to forward this to my daughter who has been making/loving fairy stuff for years. As soon as I saw this on the party posts had to tell her about it. So doggoned clever and perfect. Love these linky parties. So cute for a fairy garden! Love that painted, Mod Podging your drawings and the plants out the top!